And yes, it does work! If you want your kids to grow up to more responsible persons, consider instilling good morals to them right from their childhood. One of the good morals you can teach your junior is on saving. Training the tender generation on embracing the savings culture will make them learn to manage their finances well even before they begin to earn. And yes, it is for this reason that we have the piggy banks for kids. Piggy banks have evolved over the decades to the present interesting animal-shaped designs. The beauty in the current cute designs is in the fact that they can double up as toys, allowing you to save on the money you would have used to buy toys for the little member(s) of the family. Below are some of the top-rated piggy banks for kids! If you are looking for a perfect gift for the toddler, this piggy bank should serve as a great option. The piggy bank is designed to introduce the young one to counting, colors, Spanish, and much more using music, funny sounds, and phrases. The cute design together with other exciting features makes it a perfect companion for the toddler. Color is among the first things that a toddler should learn. The Fisher-Price & Laugh Piggy bank comes with ten coins which teaches the little one to distinguish colors easily. The coins have an animal on one side while the remaining face of the coin teaches numbers. Obviously, your little one will not remain a toddler forever since development takes place with time. This explains why this unit employs the Smart Stages Technology. This technology upgrades the learning content as the young one grows so that the little one may grow with it. This piggy bank for kids comes equipped with 40+ songs, tunes, and phrases. The phrases offer the two levels of play and encourage the little one to think through counting of the coins. The put-and-take-play design helps to develop the junior’s motor skill development. Teaches to count in both English and Spanish. The coins are large and durable. Ten coins is a good number just in case some get lost. One needs to insert the coins quite fast to continue with the counting; otherwise, it will reset and begin to recount from 1. If you want a strong bank, ceramic options offer the best. And yes, this piggy bank comes with ceramic construction that will last for years to come. The unit is beautifully hand-painted with green and pink circles which makes it look good. Apart from the painted green and pink circles, this unit also features a marching green bow at the top of the head. This feature helps to give it an adorable and charming visual appeal that your little one will love to be associated with. One thing you will notice about this piggy bank for kids is that it is larger as compared to most of the other options. This size provides plenty of space to hold the baby’s savings so that they can save for longer. This unit also features non-scratch pads at the feet. The padding helps to protect the surface where it stands, ensuring that it doesn’t cause damages to the furniture or the shelving. The dry erase board marker allows for personalization- you can even write the young one’s name on the bank. It comes with a generous size. It is a real pain when the coins get in the feet. One of the best things you can teach the little one is to save a portion of the money they get from relatives and family friends in their special days. And yes, this Pokemon Pokeball Coin Bank will keep their savings safely put until it has accumulated to a substantial amount. The bank measures 7 inches wide hence will offer much room for holding more savings. 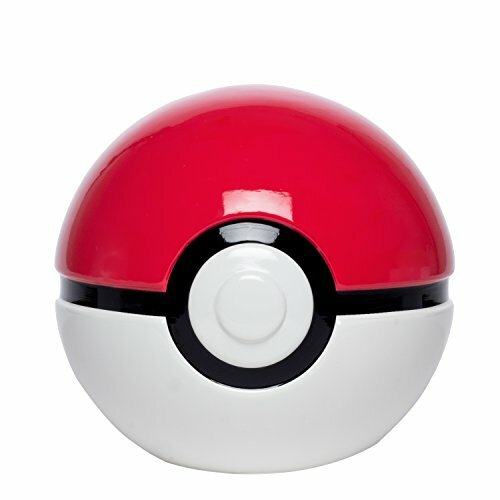 This coin banks for the kids come with a perfect combination of red and white colors that makes the unit to look great. The two colors will readily go with any home decor which makes them an excellent gift for the kids in any home. The appealing appearance will also attract the little ones to save more. Quality is something that you should always consider when buying anything. When it comes to piggy banks, this is among the high-quality options you may consider carrying home. The unit comes with premium-grade ceramic construction that guarantees long service life. If you want to save more, ensure that you get a larger piggy bank. This rounded bank features a large diameter of 7 inches. In other words, it comes with a roomier interior that provides more space for the little one’s savings. It does not come with a stopper. As the name goes, this piggy bank is specially designed for girls. The unit comes with a high-quality ceramic material known as dolomite that guarantees increased durability. We hope the little princess will grow with the keepsake as she learns to save her money. 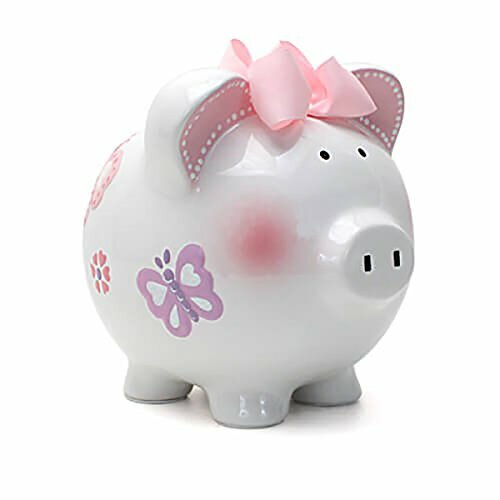 Although this specific make is for girls, the piggy bank is also available in other shapes, designs, sizes, and multiple color options and themes. The wide varieties mean that they will suit both girls and boys rooms alike. We all love beauty, and so do the little ones! Therefore, the Child to Cherish Ceramic Piggy Bank colorful pics and flowers that grants the piggy bank beauty. The beautiful drawings are complemented by the purple ears and the purple bow! This feature makes it an ideal option for those that are in the lookout for a combination of aesthetics and durability. This piggy bank features a 1.5-inch coin slot at the top which makes it easy to put the savings even without your intervention. Also, the beautiful bank features a removable rubber stop at the bottom which prevents the coins from escaping through the beneath. The larger size encourages more savings and takes more time to be filled up. There are multiple options available for individualized needs. Has holes at the bottom although they come with a stopper. 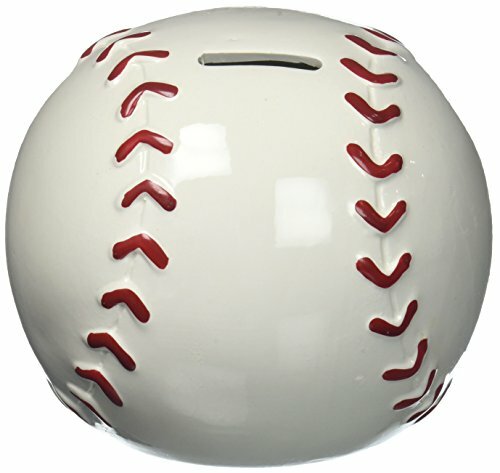 Just as the name suggests, this high-quality piggy bank takes after the shape of a baseball. The high-quality unit comes with a sturdy premium construction that can withstand the test of time. The size is also pretty large to provide more room for savings. The piggy bank comes with a baseball theme, the American’s greatest sport. Therefore, this bank will be a standout option for the little ones who already show some passion for baseball. This design means that it will blend into your sports room. As you buy a piggy bank for kids, it’s vital you ensure that the construction is solid. This model comes with a robust ceramic construction that can stand up to the rough handling by the little ones for several years to come. The piggy bank also features a stopper at the opening located at the bottom of the unit. 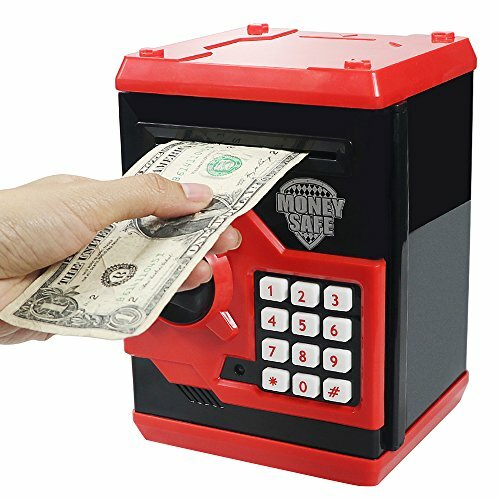 The stopper keeps the money correctly put. Although it can be removed easily, it will not accidentally fall out to guarantee the safety of your money. The size of the unit is perfect. Perfect for the baseball enthusiasts. It is a cute option. Some come with uneven slots. If you have a hard playing junior, this piggy bank should turn the perfect suit for him. The piece comes with solid vinyl construction that will come out in great shape even after years of being dropped from the table and thrown across a room. 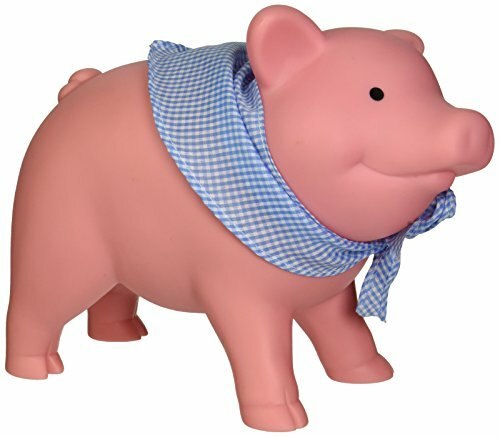 One great feature about Schylling Rubber Piggy Bank is that it is neither too small nor too big. The medium size means that the little one will have enough space to accommodate their savings without the unit taking much space on the shelf. For the young ones with high destructive power, ceramic piggy banks may not be the perfect option for them since they can easily break when dropped. However, this unit is of top-quality vinyl material that will not break. This feature makes it an ideal option for playful young ones. Although it has an opening at the top for dropping coins in, you can also remove the head with ease when you need to put in the larger coins. The opening under the belly is designed to keep the coins put when playing- you can let the little one play with the peace of mind that the coins will not spill! The unit will not break. It is not easy for the little one to open. The hollow legs trap some coins. This option is a multiple-award winner that aims to teach kids how to budget their finances. The bank consists of three separate chambers labelled save, spend, and share on the sides. Therefore, this moneybox will not only teach values on saving but also on sharing and spending to help develop a child who fits perfectly in society. This moneybox consists of three diamond-shaped canisters that keep savings separate from the amount intended for spending and sharing. The three chambers can be bundled together using a high-quality rubber band and separated when there is a need to inspect or transfer money between them. The moneybox comes with a passbook for recording the amount they have deposited or withdrawn. This feature makes keeping track of the amount in each tin a breeze. The passbook is partitioned into three sections (save, spend, and share) to provide a separate record for each of the chambers. This feature makes it a great math learning tool. One of the ways to increase your spending’s is by saving the change after you make a purchase. Each of the canisters features an acrylic lid that measures 1.5 inches long and 5/16 inches wide for easy depositing of change and folded bills. The pack contains a family guide. The metals tins are pretty hard. The rubber band is too tight hence hard for the kids to put the canisters together. If you want something that looks classy, you may consider trying out this stylish piggy bank for kids. The unit comes with a cute blue color with a decoration of white polka dots at the ears and feet to add unique accents of beauty to any room decor. Among the fantastic features of this classy bank is felted feet. The surface-protecting feet means that you can place it on a table, bookshelf, or any other place with the peace of mind that it will not scratch the surface. Opening a piggy bank can be a real pain especially if it does not feature an outlet. With this in mind, this ceramic piggy bank features a handy rubber stopper underneath. The stopper is easy for you to remove for easy access to the savings but a real hassle for the little one to prevent unnecessary frequent removal. Want the bank named after the little one’s name? No problem! This option can be customized so that it comes with the name of the child. This feature renders it a special gift for the juvenile in special days such as birthdays, Christmas, baby shower, new year, or any other special occasion. It is also available in pink color. It is made to last. The ceramic material may not be perfect for the playful juniors. The earlier you start training a kid to save the better. However, if you haven’t started, it is still not too late to change the way he/she handles the little amount of money received from the loved ones. 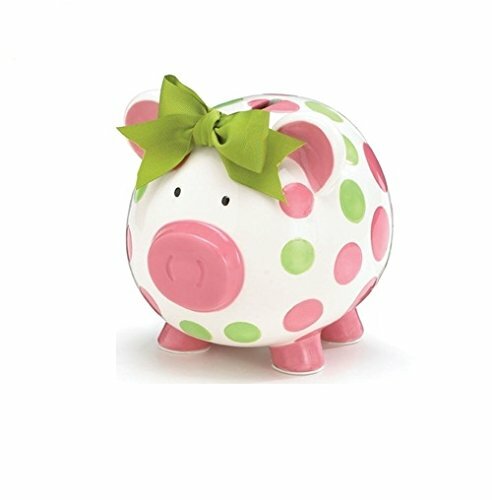 This piggy bank is one of the top-rated options you may get for the young member of the family. Color preference may vary depending on a person. This bank is available in three colors, grey, pink, and blue to meet different color preferences. Whichever color you choose, it comes with polka dots that grants the unit beauty that cannot be beaten. The high-quality piggy bank also features a premium-quality rubber stopper at the bottom. The stopper ensures that all the baby’s hard-earned bankroll remain put in the unit. It also makes retrieving the savings a breeze when it’s time to “break the bank.” No more busting with the hammer to get the savings! 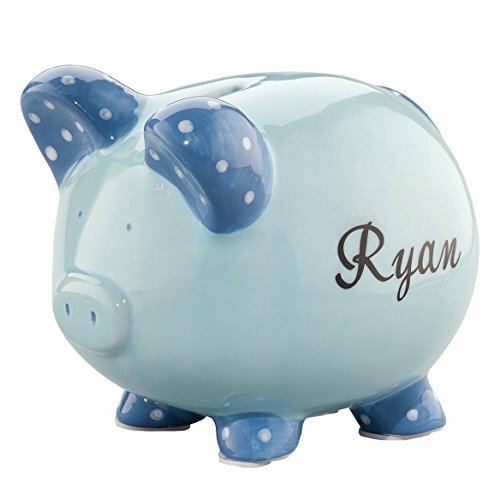 This keepsake piggy bank is large enough to hold your baby’s savings for years and yet small enough to ensure that it doesn’t take much space on the surface you place it on. The bank is an excellent addition to a child’s dresser, nightstand, table, bookshelf. It comes with decent size. It is thicker to avoid breaking easily. The bottom plug stays tight. The painting is not perfect on one side. If you are looking for a more modernized piggy bank, this should be what you are seeking for. Removable 3 AA batteries power the electronic piggy bank. The housing of the bank is of commercial-grade ABS material that guarantees durability. 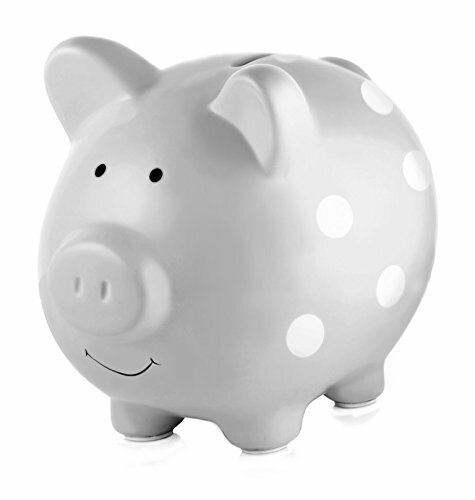 Unlike the other piggy banks that come with a stopper for retrieval, HUSAN Electronic Piggy Bank requires one to insert a four-digit pin to withdraw the saved amount. The default password is “0000” which can be easily changed for guaranteed safety. The little ones are likely to forget. Just in case he/she cannot remember the password, you can utilize the password auto-reset function to set a new password. All you need to do is to remove the batteries and leave the unit for five minutes to restore the password to default. 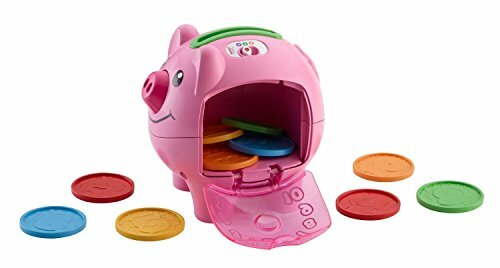 Unlike the conventional piggy banks, this unit comes with two slots. One slot permits you to put coins into the bank while the other slot takes the paper money. The bank is large enough to hold up to 600 pieces of coins and up to 100 units of paper money. Resetting the password is straightforward. The password protection eliminates retrieval hassle. The cash deposit slot is of the right size. The voice mode may be quite confusing especially if you are not used to it. Most piggy banks are of ceramic although plastic and metal options still exist. Ceramic options are stylish but break easily. The plastic material on the other side may not be classy, but they do not break, same to the metallic options. Some piggy banks come with the shape of a pig while others take different forms. Choose a design that will attract the little one to the unit. Usually, the pig shapes are great for this. If you need a piggy bank that will hold a higher amount of savings, or maybe there is plenty of space in your home, consider choosing the larger options. However, if space is limited, the smaller versions are ideal for you. Why is a piggy bank a pig? Initially, people saved the spare coins in containers made of pygg clay. Therefore, people called them pygg containers. Later on, they started calling these containers pigg banks. However, after some time, the word pygg bank started being misinterpreted as pig banks and porters began to make them in the shape of a pig. It is from the shape that the name piggy banks came into existence. What is the fastest way to save money using a piggy bank? Answer: There are many ways that you can trick yourself to saving more. Most people embrace the 52-week challenge where they save the number of dollars that correspond to the week number in a year. For example, in the first week of the year, you may save $1, $2 in the second week and so on to $52 in the final week of the year. Also, you may decide to save the discounts you receive from purchases. Another great way to increase your savings is by saving the change you receive after you buy something from a shop. How do you open a piggy bank? Most of the piggy banks have a rubber stopper that is normally located underneath for easy retrieval. However, some piggy banks use password protection to control access and retrieval of cash. Nothing beats piggy banks in teaching the kids on how to save. The right piggy bank for you will depend on your preference in terms of the material, shape, design, size, color, and the age of the little one. 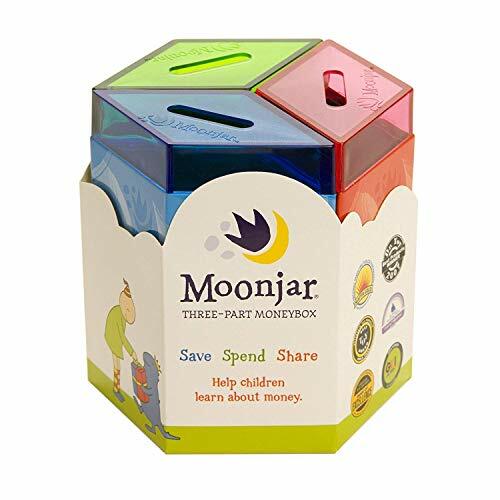 However, if I were to choose the right one for my little prince, I would go for the Moonjar Classic Save Spend Share Tin Moneybox Piggy Bank since it teaches beyond just saving.